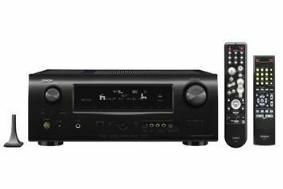 Denon announces UK-tuned multichannel receiver range – from £349 | What Hi-Fi? All three offer Dolby TrueHD and DTS-HD audio decoding as standard, HDMI 1.3a compatibility, support for Deep Colour, Audyssey auto set-up and Denon iPod dock control. The range comprises the entry-level, 5.1 AVR-1610 (£349), the 7.1 AVR-1910 (£479) and the 7.1 AVR-2310 (£849). The latter two models have been tuned specifically for the UK market, and include video upconversion and scaling from all analogue sources to 1080p resolution, plus support for Dolby Pro-Logic IIz. Roger Batchelor, Denon UK's product marketing manager, says: "The UK tuning programme demonstrates Denon's acknowledgement of the special importance of the domestic UK market, and we are confident the new series will entertain and thrill new and existing Denon customers." Denon is also working on new models for its midrange and high-end receiver ranges. Details on those will be announced in May.